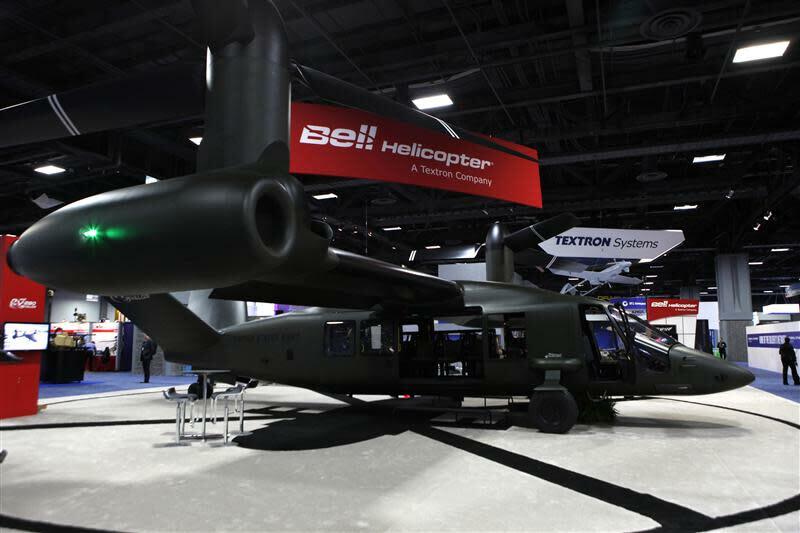 FORT WORTH, Texas (Reuters) - The tilt-rotor aircraft that Textron Inc's (TXT) Bell Helicopter is designing for a U.S. Army competition would help troops travel longer distances as the military shifts focus to the Asia-Pacific region, a company official said. Bell is trying to capitalize on its experience building the V-22 Osprey tilt-rotor plane together with Boeing Co (BA) as it designs a lighter, cheaper and less complex aircraft, the V-280 Valor, that could eventually translate into billions of dollars of orders for the winner of the Army competition. "We're leveraging all those lessons learned and bringing them forward to revolutionize how the Army conducts operations in the future," Keith Flail, a former Army officer and program director for Bell's "Future Vertical Lift" efforts, told Reuters in an interview. Flail leads more than 100 engineers and other experts who are working on the V-280 at a low-rise office about 15 minutes from the company's larger facility in Fort Worth, Texas. Bell is on track to fly a demonstrator aircraft in 2017, Flail said. The V-280 will use composite materials, a new straight-edged wing design, and fixed engine nacelles instead of the rotating ones used on the V-22. "It's really all about affordability," he said last week. "The technology we're looking at here is to reduce weight and to reduce cost and to reduce complexity." Tilt-rotor aircraft take off and land like a helicopter but fly like a plane. Bell has teamed up with Lockheed Martin Corp (LMT) and Spirit Aerosystems Holdings Inc (SPR) for the V-280. It is one of four bidders the Army chose in September to work on a preliminary technology demonstrator for the "Joint Multirole" aircraft that will replace thousands of Boeing Apache and Sikorsky Black Hawk helicopters now in use. The Army plans to choose two firms to build prototypes next June with an eye to first flights in late fiscal 2017. Boeing teamed up with Sikorsky, a unit of United Technologies Corp (UTX), to bid for the new program, using Sikorsky's X2 design. Two smaller firms, AVX Aircraft Co and Karem Aircraft Inc, also won contracts for initial design work. Bell and Karem are both working on designs based on tilt-rotor aircraft. Such aircraft are particularly well-suited for the vast Asia-Pacific region since they can fly farther and faster using less fuel than a conventional helicopter, Flail said. Chris Gehler, another former Army officer and head of V-280 business development, said Army officers who had worked with the Marine Corps' V-22s in Afghanistan and Iraq were keen to acquire similar technology, especially given the increasing focus on regions like Asia and even Africa. "The sweet spot for speed, range and payload, that's really where the tilt-rotor outshines the other technology, and that's particularly important when the Army and the Department of Defense are talking about a pivot in strategy to the Pacific region," Gehler said. He said Army officials were interested in new aircraft that could travel at higher speeds than current helicopters, which could help Bell's tilt-rotor bid. Virginia-based defense consultant Jim McAleese said the V-280 program was critical for Bell, since production of the V-22, its largest military program, has peaked, and the Army has canceled plans to upgrade its 1960s-era OH-58 Kiowa Warriors, work that would have been done by Bell.